The technological advancement has made it easier for cybercriminals by granting access to everything while sitting in one place. In today’s ever-evolving cyber attacks, hackers develop more advanced weapons in cyberspace that will allow them to bypass the virus protection programs and thus, get into the systems to steal valuable data, funds or personal identities. In many cases, internet users are tricked into revealing the information. Even though a lot has been said about cyber attacks and cybercriminals, not many of us essentially understand who are they? what do they want? and, how do they get it? Keep reading this article to know how to steer clear of cyber attacks and learn how to remain safe during such targeted attacks. Firstly, it is equally important to understand what are cyber crimes. The term cybercrime is referred to criminal activities carried out by cybercriminals using the computer and the internet as a tool or target. There are numerous cyber crimes happening today and to name a few, they are – cyber scams, cyber terrorism, creation and/or distribution of viruses, credit card frauds, and so on. Cybercriminals are tough to spot, but if you can identify these four common cyber threats then you may save yourself from cyber attack. Besides this, never ignore to install an on-demand free antivirus software on your computer which will protect you from a variety of online threats. Cybercriminals fake an identity and request data-rich information like a filled out tax form frequently in a time-pressured scenario. These online thieves send malicious emails altered to appear legitimate containing links to unlock access to banking credentials, trade secrets or personal information. Most confirmed data breaches are the result of hackers leveraging weak, default or stolen passwords. The growth of ransomware as a service makes it easier for bad actors to seize control of data and force victims to pay them. Cybercriminals target businesses, large corporations and financial institutions hoping to profit out of their malicious activity. They also victimize individuals for stealing personal data that can be used for unlawful acts. In the recent times, small businesses are being targeted, as the data they process is highly valuable. Losing valuable information like this can ruin the reputation of any business, in order to protect, use an antivirus program on all your computers for staying safe on the web. In this digital age, any device that connects to the internet can pose a potential risk to the system security. Thereby, it is necessary to protect the data and ward off such unanticipated dangers. Adhere to these guidelines and protect your data from the unknown online criminals. Avoid opening emails when you are not sure about their source. If you still insist on going through the mail – verify the sender before you open. Unknown messages with links to unknown sites may be a trap to a phishing scam. So think before you make your move, make sure it is safe before you browse through the suspicious website. Again, if you really don’t know anything about the origins, never open the attachment. Choose to have strong passwords, let your password contain numerics and special characters. Never use the same password for multiple accounts, the job a hacker becomes easier. Use the free Wi-Fi available in the public places whenever it is necessary and don’t upload or download any personal data. Make sure you have a robust anti-virus in place to counter hacker attacks and to ensure safety. 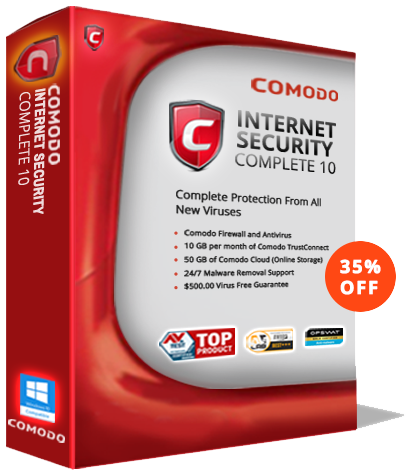 Comodo Antivirus Software is designed to drive away the unanticipated threats and to offer all-around security. The primary goal of the virus removal program is to safeguard data and protect from unauthorized access, thus you can stay calm and relieved to focus on your strategic initiatives.